Robert Lewandowski celebrated his 100th Bundesliga appearance in a Bayern Munich shirt with a brace in a swashbuckling 4-0 win over Mainz at the Allianz Arena. Bayern goalkeeper Manuel Neuer was first into action to push an effort from Daniel Brosinski around his left-hand post, but the hosts soon took charge. Joshua Kimmich cut a cute ball inside for Thomas Müller, who side-footed through a busy penalty area with the aid of an Arjen Robben deflection. Robin Quaison failed to get the better of Neuer one-on-one, before Rene Adler pulled off a superb double save from Robben and Arturo Vidal at the other end. Kingsley Coman contrived to hit the crossbar form point-black range after a lightning-quick breakaway, but Bayern made no mistake with their next attempt as Robben collected from Kimmich and nonchalantly clipped the ball over Adler for 2-0. Lewandowski got on the end of a probing Müller cross to end the game as a contest early in the second half. The prolific Polish striker almost doubled his tally moments later, but Brosinski was in the right place at the right time to make the block. Although Fabian Frei kept Neuer honest with a ferocious long-range drive, there was a real air of inevitability about Bayern's fourth and final goal of the afternoon. Vidal had already gone close, before Lewandowski met another superb Kimmich cross to bring up his ninth goal of the season in all competitions. There was still time for Bayern substitute Sebastian Rudy to rattle an upright as the defending champions kicked off Oktoberfest season in style. Kimmich was barely tested defensively, but - with a hand in all four goals - was simply unplayable in attack. 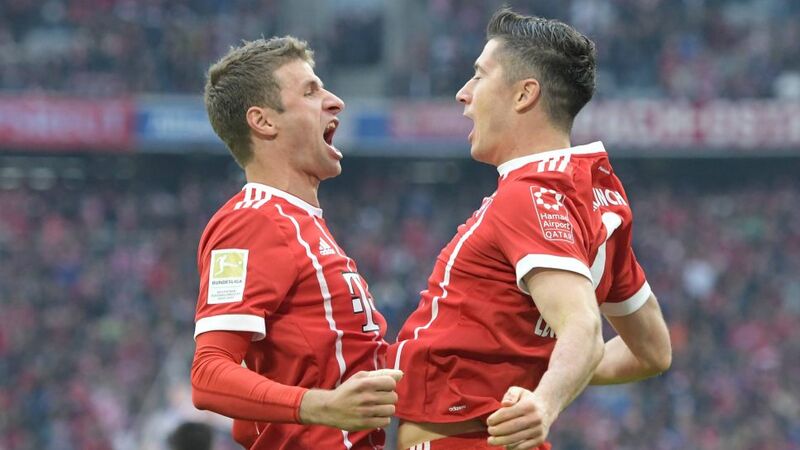 Bayern haven't lost a Bundesliga game during Oktoberfest since 2010 (19 wins, four draws), when they were beaten 2-1 at home by Mainz.Lewandowski has already notched up an incredible 82 goals, more than any other player in their first 100 Bundesliga outings. He also overtakes Wolfsburg's Mario Gomez as the Bundesliga's highest-scoring active player (156).Müller and Robben scored their first goals of the current campaign.Kimmich registered three assists in a single game for the first time in his career.Jerome Boateng made his first start since Matchday 34 of last season.Mainz's Adler has conceded 54 goals in 17 career Bundesliga outings against Bayern. Click here to visit the Bayern vs. Mainz Match Centre!